Despite the wet and wintry weather on the evening of the 26th April, Montagu welcomed the new owners of The Rambling Rose in the traditional warm manner. The first of the planned once-monthly Evening Dinners was a great success when diners packed the restaurant to sample the introductory Crayfish Tails special on offer. The atmosphere was abuzz with chatter and everyone clearly enjoyed the food and the company. 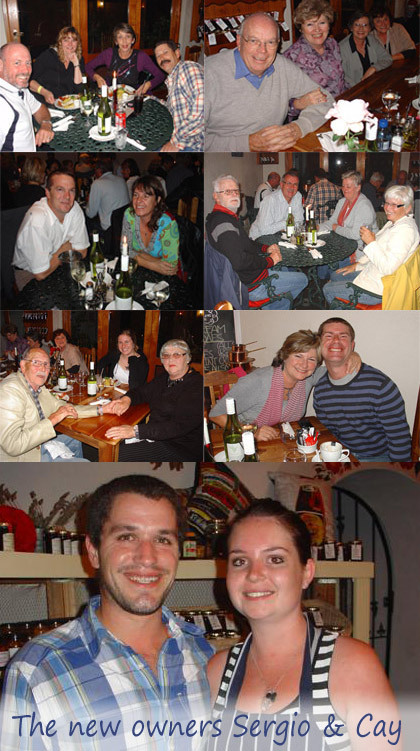 The new owners of The Rambling Rose are Gerard and Susanne Mare of Cape Town. It is their daughter Cay - a qualified chef - and her partner Sergio Fernandes who will be managing the restaurant though. Cay says that she is excited about their move to Montagu and thrilled at the opportunity to run the restaurant on her own. We wish the new team all the very best - a long, successful and happy stay in Montagu.